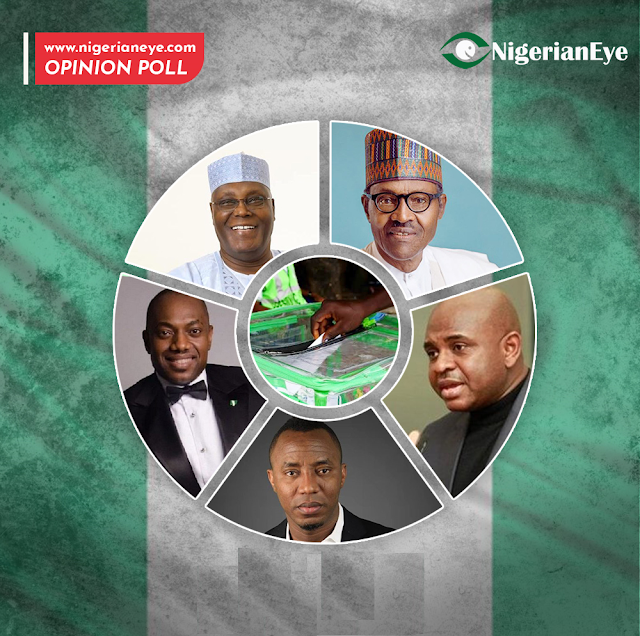 Home | News | General | NIGERIANEYE.COM OPINION POLL: Who Will Win The February 16 Presidential Polls? NIGERIANEYE.COM OPINION POLL: Who Will Win The February 16 Presidential Polls? The ruling All Progressives Congress, (APC) submitted the names of President Muhammadu Buhari and Yemi Osinbajo , while the main opposition Peoples Democratic Party, (PDP) submitted the names of Atiku Abubakar and Peter Obi as presidential and vice presidential candidates. As we edge closer to the February 16 presidential poll. NigerianEye.com is using this medium to sample the opinion of millions of Nigerians home and abroad. And the big question is. . .
Who do you think will win the 2019 presidential elections? You can vote using the poll below, you can only vote once, and one aspirant at a time. Furthermore, you can also vote using the comments section by dropping the name and political party represented by your preferred presidential aspirant. Comments/reasons why you are voting for a particular aspirant are also welcome in the comments section below. Political Advertorials in the comments section are not allowed. No swearing, No form of racism or tribal abuse allowed. Poll is open until 14th February,2019 and the results of the poll will be announced on www.nigerianeye.com on the eve of the presidential polls.